Around 90% of world trade is carried out by the shipping industry today. The world fleet of over 50,000 merchant ships is registered in over 150 nations and manned by over a million seafarers of virtually every nationality (See here). Yet, while seaborne trade continues to expand, and the shipping industry is considered a highly efficient mode of transport, corruption has become one of the industry’s biggest challenges. Social extortion by officials, even of small amounts, is powerful because small delays have very high costs. In shipping, the most well-known anti-corruption initiative is an industry-led one: The Maritime Anti-Corruption Network (MACN). While in the past paying bribes to clear customs and port authorities was seen as relatively normal, stronger national anti-corruption legislation and the rise in operational costs due to corruption has triggered this collective response by the shipping industry. The originating author of this review is Mark Pyman, managing editor of CurbingCorruption. Additional contributions have been made by Eléonore de la Bache. Shipping is seen as being more exposed to corruption and less active in tackling it than other industries: ‘It is a global industry that does not have a mature anti-corruption compliance culture. It is traditionally very opaque and has only made a slow shift to greater transparency. Fraud, bribery and other illegalities are endemic to some parts of the industry, and the world’. (Interview with Alexandra Wrage in Maritime CEO interview April 2015). Analyses of corruption risks in the maritime industry have focused on the demand and supply of bribes in ports and customs. Most of the literature on the topic looks at what is happening when a vessel enters a port and the different obstacles it faces to clear customs. While corruption risks in ports is relatively new topic of analysis, corruption in customs is generally well documented. Ship to ship smuggling For example, smuggling of illicit fuel is a widespread problem, such as smuggling of Libyan fuel off the cost of Malta. Deloitte (2015) have similarly summarised the different fraud risk prone areas of the shipping industry. They use a flow diagram below to illustrate the risk-prone areas. 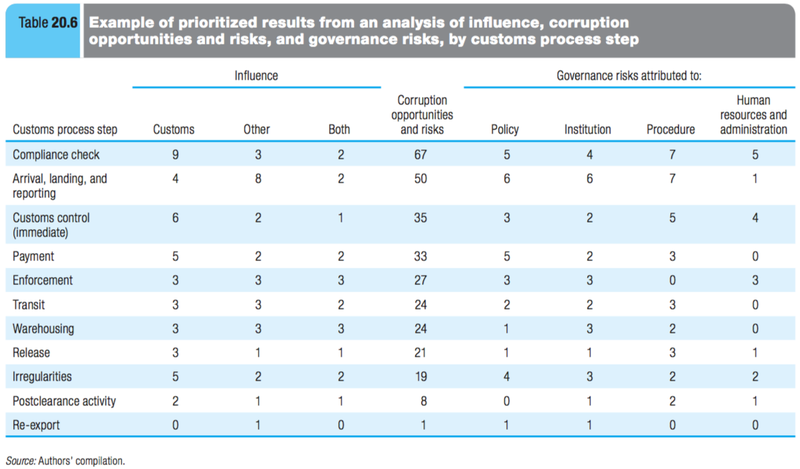 The World Bank has guidance on how to identify corruption risk in customs operations. See Section 4 for an extract from the World Bank 2011 book on risk modelling for border corruption (Durrani et al 2011). And action at Transnational level: IMO and WCO are the two most relevant organisations, but less is happening in this sector than in other sectors. TRACE is an anti-corruption compliance organisation who have established a Shipping and Maritime Initiative with vessel owners, shipping agents and freight forwarders. Establishment of an anonymous and independent reporting mechanism to company’s management and leading industry players such as MACN, BIMCO, Intercargo, Intertanko, relevant P&I Clubs and ship- owners’ associations. their commitment to transparency and anti-bribery compliance to everyone in the industry, including government officials. Another example is from Danish shipping giant Maersk, which is the shipping company that has been most active on anti-corruption. They have a strong published stance against bribery. Maersk have invested heavily in stopping facilitation payments (separate from their engagement with MACN), starting with an effective system whereby the Captains log all small facilitation requests. 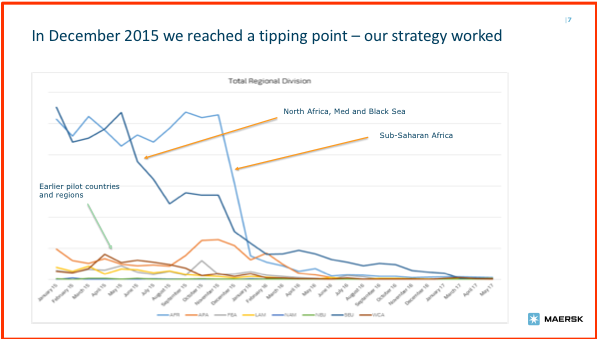 The trend of the number of these requests worldwide from Jan 2015 to May 2017 – shown in the Maersk data below – shows the success of their initiative (Slide given to the author by Maersk February 2018; published with permission of Maersk). What did Maersk do in this case? They understood the process in great detail and developed how the procedures should look into a ‘blueprint’. This was very helpful to the Captains, especially guidance on the psychology of dealing with the different styles from those requesting the gifts. For example, there is a tendency from many officials to be the nice guy, ‘so sorry’ this has to be a yellow paper, just give me cigarettes. But they may come back later, if unsatisfied, with tougher measures such as to confiscate the crew. Maersk makes it clear to their Captains that they support escalation. Escalation is usually to the local Maersk office. Very few other companies have such local offices, and this is a key part of Maersk’s ability to succeed in this process. Maersk rolled out the IT system and the blueprint as a global project. This was a tipping point (early 2016), after which these issues declined dramatically. Captains now have an incentive to report and no place to buy. Despite this strong procedure, Maersk does not make it a fixed policy to forbid the making of facilitation payments by the Captains. They believe that this system is more effective and gets more cooperation from the captains. Safety is the key reason for this: harm can come to the Captains, such as being dragged off the ship and interrogated in unpleasant jails. All shipping companies to track vessel facilitation payments: This can be as powerful as Maersk’s experience: we understand that some other companies are already doing this. Building the confidence of Captains to negotiate: As in so many sectors, the key people don’t talk about this subject. Corruption is not taught at marine school. Corruption faces the Captains daily, yet no-one says a word about it at school. The first step can be so ‘easy’ as to bring the topic into open, easy discussion. Of course, it’s not really easy, but with the right atmosphere and interpersonal skill this can open up the whole conversation. One unpublished study of Captains being asked for bribes found that 78% did pay up, 22% did not pay up. The key differentiator was whether the Captain had training in such negotiations. (Personal communication to author from Bruce Horovitz). The Maritime Anti-Corruption Network (MACN), consisting of shipping and freight-forwarding companies, and some key ship investors, has grown over five years from around 20 members to over 70. The MACN launched its first Collective Action project in Nigeria in partnership with the UN Development Program (UNDP) in 2012. It combats corruption in major Nigerian ports, where vessels have often been met with demands for facilitation payments by port officials. Nigeria’s government and the companies involved both acknowledged the problem and their commitment to resolve it. Below is MACN’s diagrammatic representation of improvement at two levels improving corporate practices makes it easier for the individual Captains to say no to demands in ports. At the same time, working to improve the operating environment makes it easier for the whole sector to strengthen the anti-corruption environment and to change practices. Relevant government agencies are now collaborating with the MACN to generate training, standard operating procedures covering the actions of vessel officers and port officials during port calls, a formal complaints process, and enhanced cooperation between various agencies. The UNDP has contributed funds and other resources to the project, which has also received support from the UK government, for example. The key aim of the MACN project is to achieve effective collaboration between government agencies and companies to eliminate corruption by employing simple practical tools and processes. Example: Shipping reform in Tanjunk Priok port, Indonesia. The risk of corruption in Indonesian ports is high, and illicit facilitation payments are common, mainly in the form of in-kinds demands such as cigarettes and beverages. Maritime companies that refuse to pay are often penalised with delays or with fines for alleged non-compliance. In addition, laws and procedures are ambiguous and opaque, making it hard for stakeholders to report and seek solutions to alleged non-compliance. MACN therefore launched a collective action which aimed at Improving container tracking IT systems; Promoting an e-governance system for cashless export licences; Integrating whistleblowing into existing procedures; Establishing stakeholder forum for discussion; and Raising awareness about laws and regulations in the maritime sector. This project resulted in ‘improving transparency of the regulation for importing goods through Tanjunk Priok and has also improved the accountability of key government stakeholders towards the private sector’. For further discussion, see G20 Germany, Business 20 Dialogue (2017). Shipping companies complain that they almost systematically need to bribe ports or customs officials to be able to enter ports and clear their shipment. In the port of Maputo for example, 53% of all shipments involve bribery. Reducing the demand-side for bribes and facilitation payments coming from ports and customs must therefore be addressed to reduce corruption in the industry. Experiences from certain ports have shown that some measures can significantly reduce bribery and improve waiting times in ports and customs. These include Online processing of clearance documentation; Development and clarification of standard operating procedures (SOPs) of port stakeholders; Establishment of a port-level complaints mechanism for potential and actual acts of corruption; Introduce inspectors’ rotation in ports and terminals to hinder collusion and development of improper arrangements; Automation of customs administration. Example: Port reform in Argentina. The shipping industry operating in Argentina is facing specific challenges regarding the inspections of holds and tanks, custom declarations, and on board-practices. Data from shipping companies highlighted a systemic issue with demands for payment for unclean gran holds, including cases of extortion. New regulations were drafted to improve specific areas: approval of a vessel’s holds or tanks for the loading of agricultural products, development of new IT system for processing and registering holds/tanks inspections. The regulation more specifically: Limits inspector’s discretion by having more precise definitions and objective criteria for holds or tanks rejection; Introduces inspectors’ rotation in ports and terminals to hinder collusion and development of proper arrangements in certain ports and client interactions; Increases the timeframe allowed for remedying hold’s deficiencies; Strengthens control mechanism by creating a new Technical Appeals Tribunal, developing a risk matrix on the basis of which inspections will be supervised and establishing a trustworthy whistleblowing hotline (Business for Social Responsibility 2016). Example: European port reform. There is very little literature regarding corruption and bribery risks in European ports, though Captains report that occasionally European ports do require payments, e.g. in Spain (Personal communication). However, some ports have taken initiatives to reduce the risk of bribery (Control Risks, European ports): In 2012, the Port of Rotterdam signed a Letter of Commitment to the UN Global Compact, one of the principles covering anti-bribery; The Hamburg Port Authority has formed an anti-corruption committee to combat bribery; Ukraine introduced an electronic cargo clearance system to reduce bribes. One stop shop for clearance in Cameroon. The automation of customs administration and introduction of a ‘one-stop shop’ for clearance procedures at Douala port in Cameroon led to a reduction of average customs clearance time from 15 days in 2000 to just over three days in 2009, according to a 2011 World Bank working paper. (Bray 2013). Example: Port reform at Douala, Cameroun. In line with the landlord model described above, ports in these three countries have started to automate customs administration and subcontract some functions to the private sector. At Douala port in Cameroon ‘the automation of customs administration and introduction of a “one-stop shop” for clearance procedures led to a reduction of average customs clearance time from almost 15 days in 2000 to just over three days in 2009, according to a 2011 World Bank working paper’ (Control Risks, African ports). Example, Port reform at Durban, South Africa. ‘The importance of automation in the context of bribery and corruption was also illustrated in a 2013 investigation into bribes paid at the ports of Durban in South Africa and Maputo in Mozambique by Seiqueira and Djankov (2013). The study highlighted the degree to which the level of automation had an inverse correlation with propensity to demand bribes. In Maputo, 80% of bribes were paid to customs rather than port authorities. The customs service in Mozambique is an arm of government and its processes lack automation, in contrast with the privately managed port. The situation in Durban is reversed, with customs authorities run by an independent regulator that has implemented a high level of automation’(Control Risks, African ports). Example: Port reform in Nigeria. Nigeria is considered one of the most challenging countries to do business due to systemic corruption. MACN supported a pilot project run together with local authorities and UNDP. The aim was to identify and address vulnerable elements in vessel port call processes where corruption is prone to take place. This included improving and harmonising public officials’ port clearance procedures. A new complaint mechanism enabled companies to file a complaint when faced with improper demands from government officials. Anti-corruption training of selected officials was conducted, and anti-corruption policies were developed for all relevant agencies (See Maersk website). 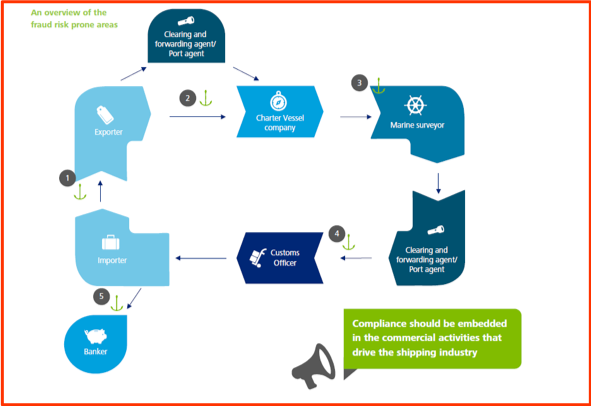 There is some sense that enforcement action is becoming more prominent in shipping sector. Here is a report by a law firm on Bribery and corruption in the shipping industry regarding the prosecution of a Shipping Marine Surveyor in Singapore (Norton Rose Fulbright 2015). ‘Anti-bribery compliance is clearly gaining ground in the maritime industry. Corruption dramatically increases the costs of transporting goods by sea and small bribes are often deeply embedded in local culture. Harsher sentencing for offenders is one means of deterring demands for bribes. …In recent years, there has been a significant uplift in anti-corruption enforcement activity, coupled with increased cooperation between regulators. For the maritime industry, the case of Public Prosecutor v Syed Mostofa Romel reflects increasing stringency against a background of growing concern around the world for anti-bribery compliance. In some waters, such as the Gulf of Guinea, there are not only corruption threats to shipping but also security issues of drug trafficking, human trafficking, oil theft and piracy. In such environments local and regional navies are taking a more active role than in the past. This, however, also has counterproductive, as those same naive become a predatory force on commercial shipping. In some regions large scale efforts are being made to tackle this. One example is in West Africa, where AFRICOM is working with the Nigerian navy, Nigerian maritime police, the Nigerian Maritime Administration and Safety Agency, the Economic Crimes Commission and others to strengthen the Rule of Law in territorial waters. A second initiative, the Africa Maritime Law Enforcement Partnership (AMLEP) has similar objectives in the same region. (For details, see Ostensen et al 2018). Make use of national embassies to assist resolving ports disagreement. One of the lessons from Maersk’s experience is that having a local office in the country is important. They know how to peacefully resolve disagreements, such as over facilitation payments. Most shipping companies do not have such local networks. One possible alternative is to see if the national embassy can assist, or if one embassy could assist on such shipping matters on behalf of as number of different national shipping companies. Establishment of a ‘Port Integrity Index’. Ports are often competing against each other within specific region. This is the case of the ports of Maputo and Durban for example. Creating a ‘Port Integrity Index’ aiming to identify ‘corrupt-free ports’ could encourage ports to develop appropriate mechanisms and reforms to reduce corruption. Sequeira and Djankov (2013) have demonstrated that firms travelled on average an additional 319kms (in some cases almost doubling their transport costs) just to avoid coercive corruption at a port. This is explained by the ‘extreme aversion shipping companies have to the uncertainty surrounding bribe payments at the most corrupt ports’. Action at port level: We have given several examples of reforms at ports, led by the ports themselves, or by MACN, or by ports in collaboration the World Bank. Action at transnational level: The only prominent example is MACN. The principal multilateral maritime organisations such as International Maritime Organisation (IMO), World Customs Organisation (WCO) and other ship industry organisations have little or no profile on the subject (See Section 4 below). If you are developing an anti-corruption strategy related to the shipping sector, we suggest you first be in touch with MACN or TRACE. However, unlike most other sectors, shipping does not have strong trans-national organisations. The only active trans-national anti-corruption initiative in shipping that we are aware of is MACN, already discussed. If you are aware of active transnational shipping anti-corruption initiatives besides MACN, let us know. Besides MACN, the not for profit due diligence organisation TRACE is active in shipping. TRACE (from their website) conducts the following activities: Partner with leading shipping and freight forwarding organizations to raise anti-bribery compliance standards in the industry, Conduct specialized training and host industry webinars for global shipping and freight forwarding companies, Provide industry intelligence via articles in leading maritime, shipping & logistics magazines and public presentations at major industry events, and Facilitate knowledge sharing and benchmarking through the TRACE Anti-Bribery Customs Working Group. (TRACE maritime website). Collectively, TRACE proposes that shipping companies should develop a « whistleblowing hotline »; visual anti-bribery campaigns, for instance posters in several languages announcing, “Don’t Ask; We Don’t Bribe; We Report” displayed on vessels”; Common Anti-Corruption Principles (already developed by the MACN Network); Capacity-building/best practice/information sharing seminars; and avoidance of ports, to the extent possible, known for high levels of bribery and corruption. IMO. The International Maritime Organisation (IMO) appears to do little in relation to corruption. They are currently being criticised for opaque decision making and an excessive level of private industry influence. For further information on this, see the recent reports from Transparency International (2018) and InfluenceMap (2017). WCO. The World Customs Organisation’s website states that it is very active on integrity and anti-corruption: ‘For more than a decade the WCO has played an active and key role in addressing the complex problem of corruption in public service and more specifically in Customs. ..Since then WCO’s integrity strategy and programme has progressed. An institutional mechanism such as an Integrity Working Group, currently Integrity Sub-Committee was established and supporting instruments such as WCO Integrity Self-Assessment Guide… as well as the WCO Integrity Action Plan were developed…To assist Members in implementing the Revised Arusha Declaration, the WCO has developed the Integrity Development Guide as a comprehensive integrity tool set. 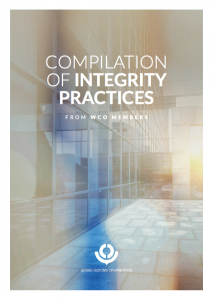 The World Customs Organisation WCO (2017) has published a compilation of good customs integrity practices from some 20 countries. One example is specific to shipping (Cameroon). 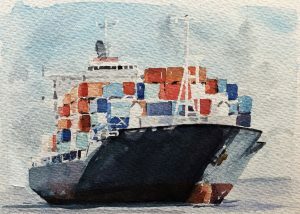 There are many member-based shipping industry organisations, such as Intercargo, Intertanko and ship- owners’ associations, though we are not aware of transnational action on corruption. One organisation that does connect to the topic is BIMCO, a large shipping industry membership organisation comprising shipowners, operators, managers, brokers and agents. ‘BIMCO offers tools to help fight corruption. Supporting this work, BIMCO has advised the IMO about the BIMCO Anti-Corruption Clause for Charter Parties. The clause addresses corruption by providing industry players with a way to respond to unlawful demands for gifts or cash. “BIMCO supports the push against maritime corruption and can help the industry by offering tool that industry players can use in the fight against unlawful demands and corruption,” says BIMCO Head of Maritime Technology and Regulation, Aron Frank Sorensen. The Bank has been active in addressing corruption in shipping and the related topic of customs reform and border reform. 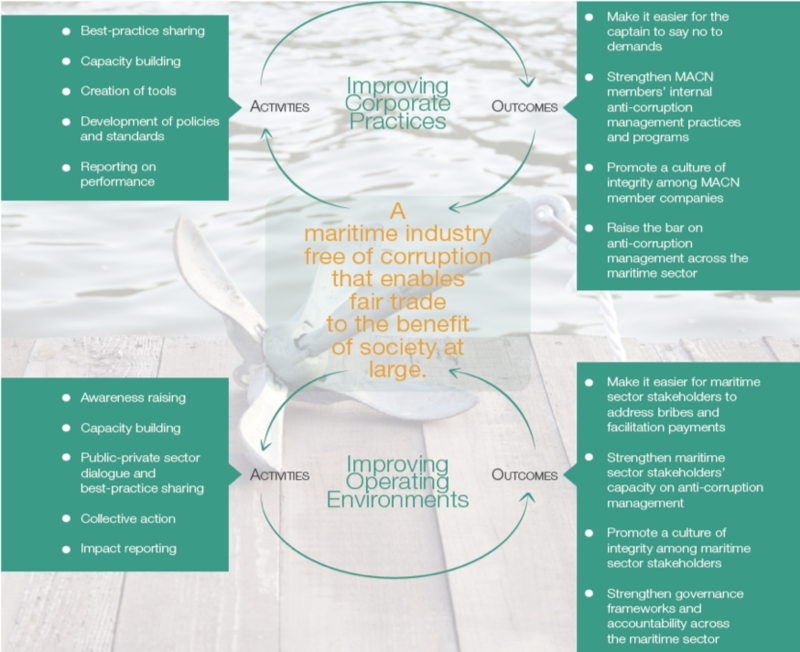 We suggest the Maritime Anti-Corruption Network website: http://www.maritime-acn.org/, some of their reports, e.g. the 2016 Impact report, the Deloitte 2015 report on Fighting Corruption in the Maritime Industry: what you need to do to navigate in transparent waters and the article Businesses in dilemma over corruption in African ports by John Bray (2013). If you know of other constructive reading, let us know.